I love this plant, Peony, and I´m looking foreward all year to see it in full flower, wich usually is in july. When it´s time is over, I´m trying to keep it a little longer. Unfolding the close to withered flower is almost like recieving a message of love. That looks like the fresh, tender pink peony from the summer collage, now a little the worse for wear. Not unlike myself. I never thought to examine a peony so closely–never knew the petals could be heart-shaped. It is the same peony, – or one of its sisters. I get about 10-15 flowers from the plant each year. Unfortunately they all arrive at the same time, and for a much too short visit, so I am photographing them as if they were stars…wich they in a way are. 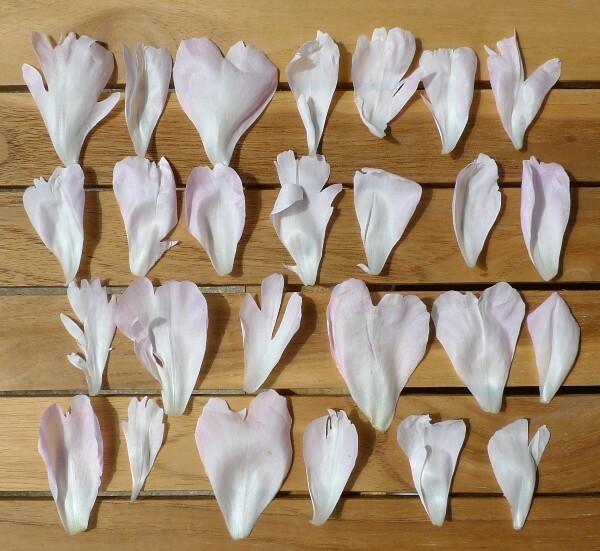 I was surprised to see how many different shapes the petals from the same flower had. Thank you for your quick response, Gerry, much appreciated. I never knew the petals were heart-shaped either! The soft pink is so pretty! I have peony and didn’t even notice that it has a heart shape petals until now. This is a great idea and beautiful composition. Thank you Nye, I am glad to know that you like it. It was fun to make it, and to see the many different shapes. I should have tried to press some (dry), though I don´t know if that would be possible. What a pretty and creative still life ! Twenty-six petals of art and love. I could not say why but to me it has a Nordic look, the lines ? the wood ? the whole design ? I don´t know but I love your composition, giiid. Giid, although I love peonies and have many beautiful blooms each year in my yard, I never realized there was such variety in their petals. The one at top left looks like a child with arms wide open. I also never would have thought of laying them out like this. Very cool. Thank you! It could be fun to hear what people see in those leaves, perhaps it could be used as a test of what´s on the viewers mind right now. I like the child with open arms at the top, a sweet thought. Thank you for sending your comment. That would be an interesting test giid. Can you tell I spend a lot of time with children? Their arms open so readily. This is so beautiful, Birgitte! Every time I look at your blog, I get another lovely surprise. I never thought to take a peony apart like this — the individual petals are as beautiful as the full blooms. picture looks really beautiful, i love it. Hi maantas. Nice to hear from you again. I am glad to know that you like the picture, even there isn´t much of a 3D effect to see in it. :-) Thank you for telling me. I am impressed about all the difficult 3D things you write about, that´s why I mentioned it. Great to learn about your photo studies, and to see some of your pictures at Flick. I haven´t an account there, which means that I can´t write comments, but I´m glad to see that many others have send you well deserved positive feedback.